Domino's has lost its O's. No A’s or O’s for the New York Yankees. No B in IBM? Major brands are losing the letters A, B and O in their logos to support the Red Cross’s new blood drive starting Monday. The Red Cross is always short of blood and looking for new ways to get people to donate. Only about 38 percent of the population is even eligible to give blood, and only about 10 percent of those people — that’s 3 percent of the population — give blood yearly. But a lot of blood is needed. 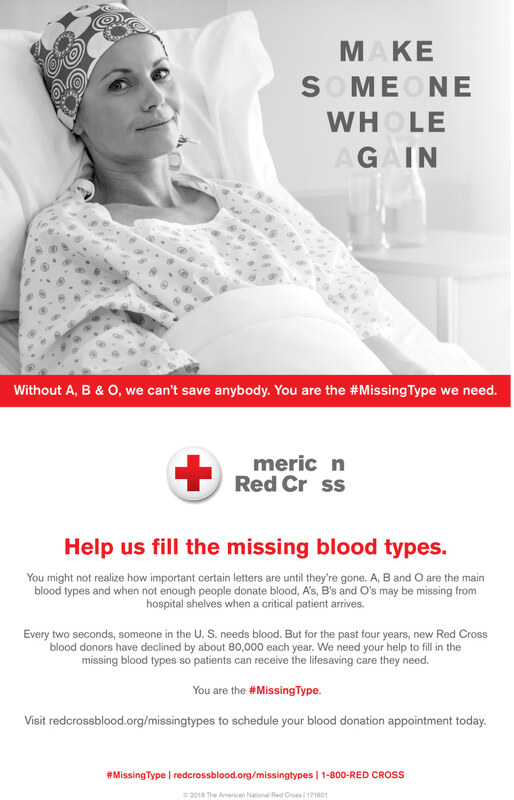 According to America’s Blood Centers — a separate group from the Red cross — 15 million pints of blood are transfused into people every year in the U.S.
Who needs it? Accident victims, cancer patients, kids with sickle cell. One of them is Tymia Pitts, a smiling, energetic 12-year-old who needs regular transfusions to treat the excruciating pain caused by sickle cell disease. Sickle cell disease is caused by a genetic mutation that causes the red blood cells to fold. This folded shape makes them clog together, cutting off circulation to vital organs and limbs. “With her, it can start anywhere in the body. Anywhere that blood flows she can have a crisis,” said Pitts, who lives in Georgetown, South Carolina. “You would never wish that type of pain on anyone. I watch my daughter and I pray,” Pitts said. The loss of blood circulation not only causes pain, but it can paralyze the little girl. “Sometimes, I just watch her color fade. She just gets lifeless,” Pitts said. “You would never wish that type of pain on anyone." That means rushing to an emergency room for a blood transfusion. But even if there is blood on hand, it might not be the right type. “She can’t get any regular old blood,” Pitts said. Recipients of regular blood transfusions, like Tymia, build up antibodies to red blood cells. Their immune systems can react against blood cells that are marked with certain antigens — surface proteins. So each pint must be tested to make sure it doesn’t carry these antigens. “One time we waited eight hours because they couldn’t find it,” Pitts said. “It had to get shipped from Columbia.” That’s two hours or longer away by road. Pitts herself cannot donate to her own daughter. Tymia is Type O and Pitts is Type A. “If we don’t have donors to actually donate, I get scared there is a possibility she won’t get blood,” Pitts said. Pitts has lost several jobs because of the time needed to take care of Tymia. “What would you do if it was you? Or what would you do if it was someone that you truly love that needs blood?”, she asked. When she is well, Tymia loves to model. She’ll almost certainly need blood transfusions for life, as do most sickle cell patients. As many as 100,000 people, mostly those of African descent, have sickle cell disease in the U.S.
They’re not the only ones in need. Cancer patients often need daily transfusions. “A single car accident victim can require as many as 100 pints of blood,” the Red Cross adds. But fewer people than ever are donating blood. “During the past four years, new donors have decreased by about 80,000 each year,” the Red Cross said.